The Rocking J Cabins and Campgrounds are located in the Little Belt Mountains. 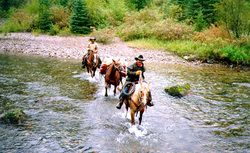 The cabins sit right on Belt Creek, where you can fish for brown, rainbow, brook, and cutthroat trout, all in the same creek. Creekside cabins are completely furnished. RV spaces available. The Rocking J is surrounded by thousands of acres of National Forest. The area is short on people and large on western hospitality, come and enjoy yourselves at the Rocking J. Directions: Rocking J Cabins and Campgrounds is located 45 minutes south of Great Falls, Montana on Highway 89 in the Little Belt Mountains, near the little town of Monarch, Montana.